Here in Calgary we have a track at Blackfoot. Here's a sat pick. 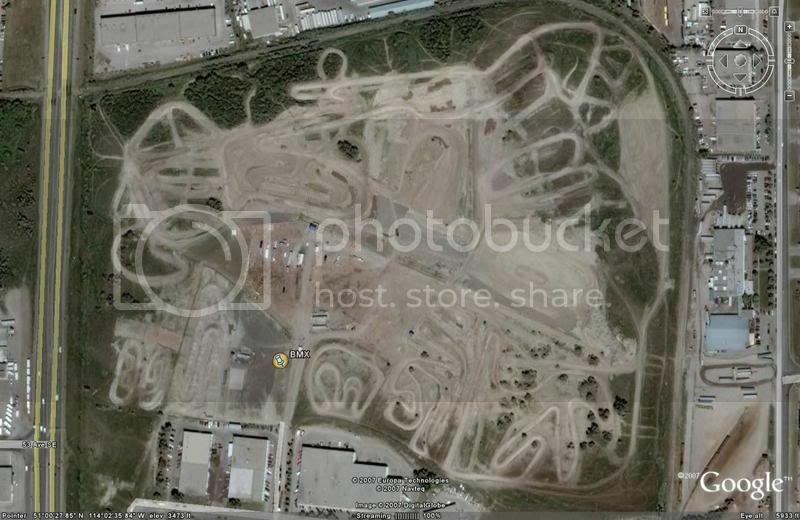 There's also a BMX track and a MX track there also. Anyone going to be there last week of July first week of August? Going to drop by and check the place out. Wife is saying that I can pack one of the cars and bring with me. Well it appears that someone's taking over the track here in Calgary. Here's a link to the websitehttp://www.punishmentrc.com/. PM me before you plan on going and I'll meet you there. Last edited by mradlin; 06-03-2007 at 07:55 AM. Here's a few small vids of my baja taken back in either Jan or Feb! "No polar bears were harmed during the making of these vids!" Hey Torque! Welcome to the site! No really...I bring it everywhere I go. Man they let anyone in here...hey AL..its Joe for Med hat...yes i jumped on the 1/5 band wagon.